We sat down last week with Ro Gilbert, Design Director, Apparel and Lauren Mallon, Director of Marketing, Strategic Partnerships for Fila to talk about the brands latest Championships, Core and Fundamentals Collections, the brand athletes who will wear the collection at Wimbledon, and the trends driving tennis apparel at retail right now. Tennis has always been a lifelong, social sport that naturally fits into your year-round lifestyle. 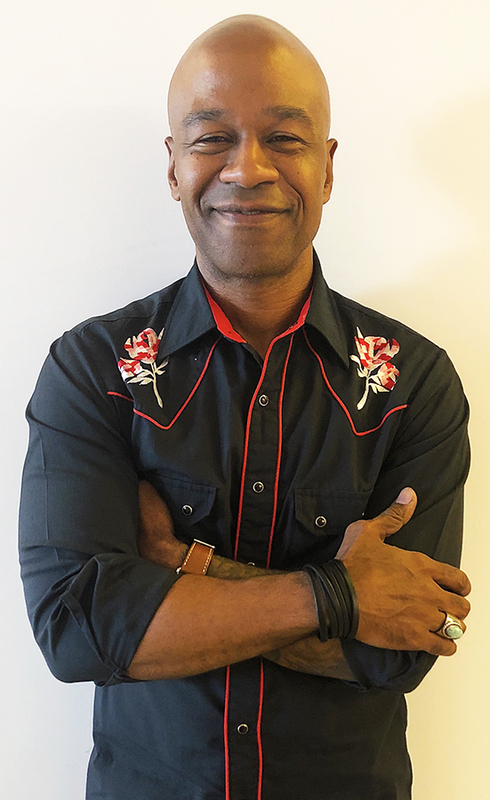 And with summer here, it’s a good time to get out and play the “perfect match” in the “perfect outfit”with a more “lifestyle” approach but still have traditional pieces in your collection. 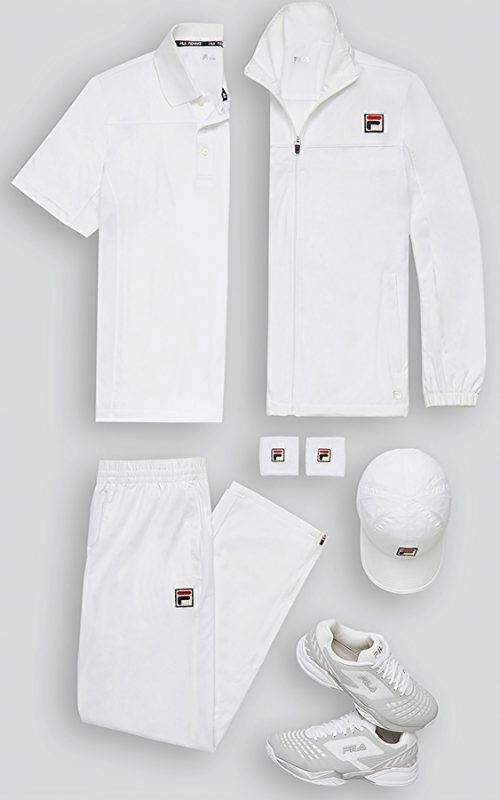 Fila’s 2018 Championships, Core and Fundamentals Wimbledon collection breaks the rules of traditional white, pictured here, with elegance and style. 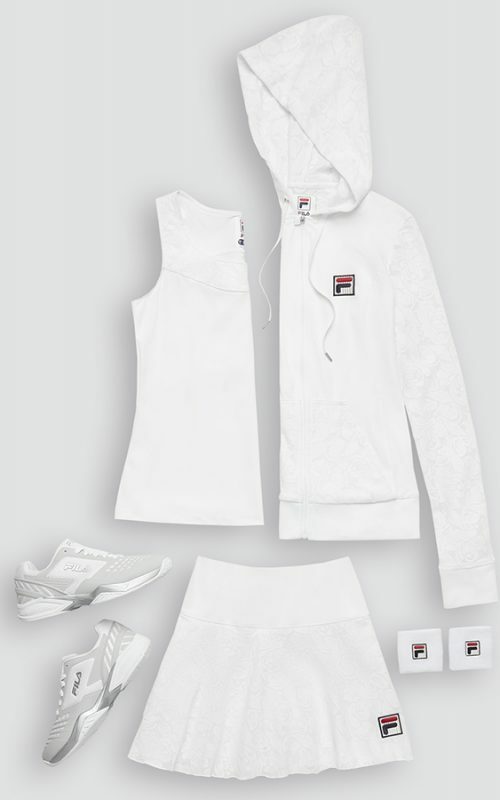 It can be a design challenge to marry fashion and function but the beautifully simple, simply elegant, all-white Championships Collection worn by Fila brand ambassador athletes Karolina Pliskova and Ashhleigh Barty at this year’s Wimbledon proves that clean lines, graceful silhouettes and stretch lace embellishments can co-exist in a performance garment. The Championships Collection consists of three different sleeveless silouhettes – the Racerback Tank, Full Coverage Tank, Cap Sleeve Top and two Skort styles. The collection offers a Dress and companion hooded zip-front Jacket using technical fabrics in designs that radiate sophistication but allow maximum flexibility and performance. Women want to feel powerful and empowered on the court. The dresses have a beautiful lace overlay, shown above. Were the ambassador athletes involved in the design process? What technical elements were considered to create the collection. RG pictured left … We do try to take into account the things that they love, the things that work, as well as isolate the things that may not work. So, yes, there is back-and-forth that goes on in the entire process. Functionally, when we put something out there, that they are wearing and performing in, its performing to the best of its abilities. Their level of performance is important to us and we make sure we think about that through the entire process from the choice of fabrics to the technology that’s infused within the fabrics. Everything needs to be perfect when it gets to the court. LM… They do receive their product in advance of Wimbledon. Our athletes are wonderful at giving us feedback and design ideas as well. We are really fortunate to have some of the best players in the world wearing and competing on the WTA and ATP World Tour in our products, so it’s a great authenticator for our tennis collection. What type of fabrics are you using for their moisture wicking properties. Are you working internally to craft the fabrics or outsourcing? RG… It’s both. We are looking at all processes when we go into this. The types of fabrics we are looking at are moisture wicking solutions that are engineered from the molecular perspective in the fabric as well. It’s not only just the fabrics but it’s how the garment is seamed. The seams are functioning with the player. We address rash areas. We pay particular attention to those areas to make sure, again, when the product arrives to the player, it’s well thought out and it only enhances their performance on the court. 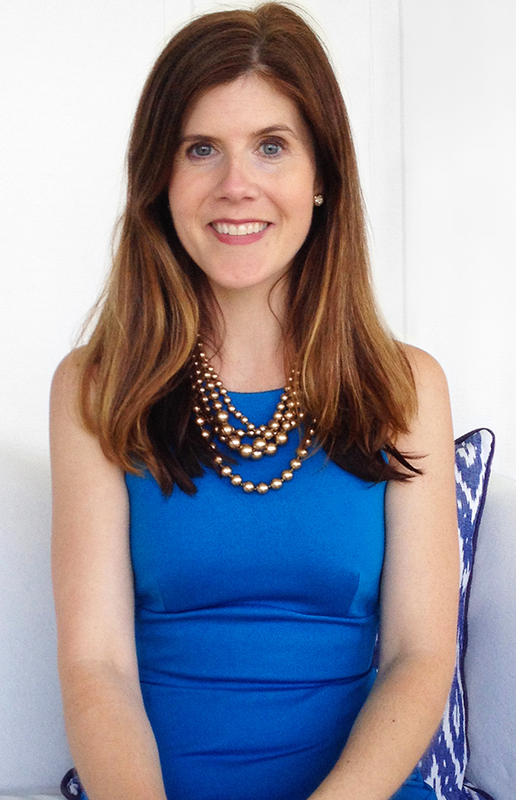 The average consumer doesn’t realize that you are actually creating a couture garment that takes into account the curves of player, the seaming so that it does not chafe and a variety of issues so that the athlete can play a long and hard game without feeling terribly uncomfortable after the first few minutes of play. If you wear a white garment versus a heavily saturated color garment, is one less reflective in the sun than the other? RG … It’s both. It’s the way the fabric is treated as an additional protection barrier but, of course, white is a color that is cooler in heat or sun. For people who love tennis, they want designs that work on and off the court for comfort, fit, durability … and style, same as the elite player. Is Fila’s Championships tennis collection also as a result of customer insight? RG … We draw a wide net to aggregate as much information on both levels as possible. Where we can marry those stories from the professional player to the weekend warrior, we do so. And, yes, we are constantly getting feedback to help us assess what the needs are for each of those levels. When you are crafting garments, do you have a luxe collection for the elite player that works its way down to the consumer level? RG …We try not to compromise. At the end of the day, no matter what level of play, the player is going to play outside and will need the exact same level of protection as the professional does. Is there a silhouette that works with all different body types that makes you look feminine but feel powerful and strong? RG … We take that into account up front and try to design a pool of styles that accentuate different types of bodies and to make sure that there is something for everyone for comfort. While it has been a part of Wimbledon for well over a century, the all-white dress code has not always been popular with the players. Over the past 20 years or so, color became a mainstream on the court as a way of self-expression and rebellion against the too-strict, all-white dress rule. 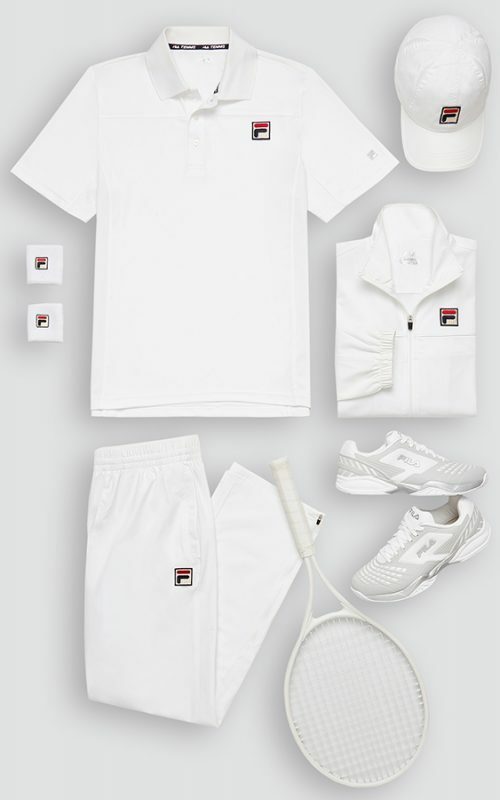 A tennis player’s fashion statement is crucial to the sport because it’s a visual snapshot about the game and it has far-reaching benefits, often for the retailer. 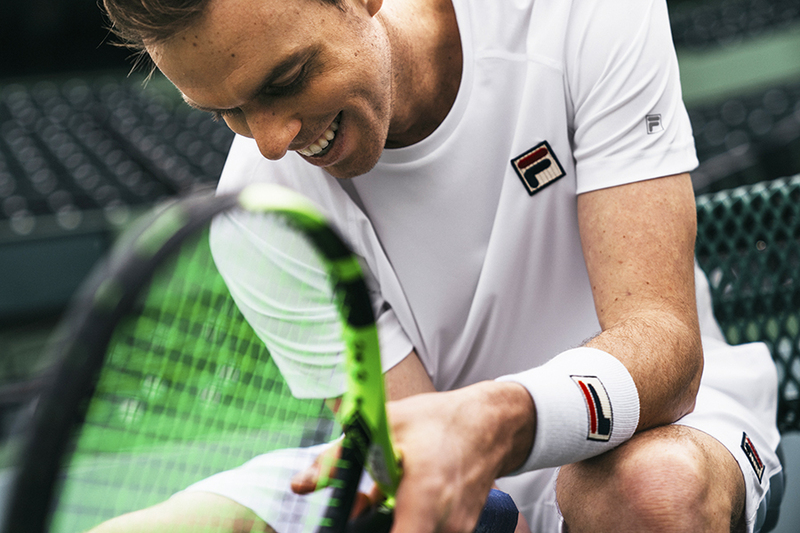 Fila Men’s Core & Fundamentals Collections, worn by brand ambassador athletes John Isner, Sam Querrey and Marin Cilic, is a nod to heritage all-white in a range of pieces including the lightweight woven textured mesh short, the color blocked crew and the poly interlocking textured mesh polo. Matching warm-up jacket and pants round out the traditional on-court look. It’s refreshing to see tennis whites in this collection. Is white back in vogue? RG … Yes, white is trending in a big way right now. It’s one of those colors that is a neutral. It’s cyclical to a point now where we have a renewed appreciation in it. And it’s an exciting time to be seen in it. LM, pictured left … There is an account base that requires white. Like the tennis clubs around the world that require their members to wear predominately white apparel. An example of that would be the International Tennis Hall of Fame, which was the home of the tennis open before it moved to Forest Hills. And there are a whole host of countries and clubs around the world where this is the norm. We have created a nice niche business out of servicing those accounts very well. This season we have two white fashion collections that are very popular with those accounts. Historically white and tennis go hand-in-hand. It was a sport for the elite and not working class. RG …White is a powerful statement and it’s a more sophisticated approach. Is the collection a nod to vintage and also to the what the consumer wants? RG … Yes. I think it’s both as well. It certainly is a nod to vintage because classics never die. But if you stick around long enough, we see trends that cycle around. So it’s the perfect marriage of the two right now [white + color] on the court. Tennis has always been a see-and-be-seen occasion. 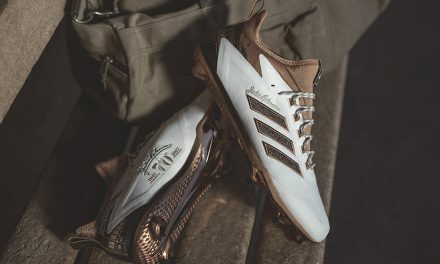 What can we expect from the fans courtside when they see the collection in London as it is conventional without being conventional, sophisticated without sacrificing performance? RG … Our hope is that the collection will create a buzz effect that will translate into retail sales. That is definitely the approach going into it and the hope and expectation to come out of it. LM… We get to experience this with some of our partnerships at different events around the world, where the fan will see our players wearing product on the ground during a match and they will come to a Fila-sponsored event at a retail store on site to buy the product or go to their local shop that carries Fila to find that look. Your tennis fan and player does like to look like the pros. Our collections get the most exposure at the tennis specialty store. For example, at the U.S. tennis open, you are going to see an uptick at tennis retail to buy these looks. When you see a grand slam being televised, it’s a direct push to sales. Do you have an established fitting program at the tennis speciality retail level? LM … Our sale reps work with the buyers and the shop staff. We have a specialty sales team that covers all of our tennis accounts and they work very closely with the buyers and with the shop management so those that are selling our product are well educated about the product and about the performance characteristics. What can you tell us about upcoming collections? 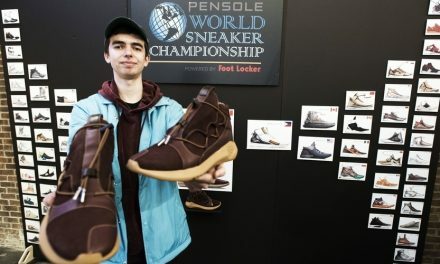 RG … We are always looking to tell both sides of the fashion, fusing with function story. And we are always looking to raise the bar. 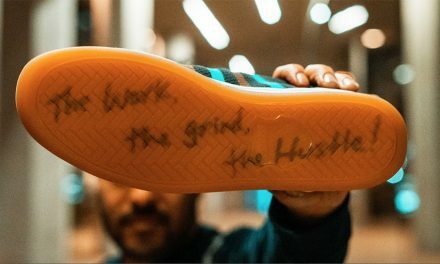 I would definitely say that there are things in the hopper that we are excited about pursuing and developing and continuing to tell the story of Fila through. From a design perspective, what we strive in has an overall arch concept, which is to create things that are able to withstand the test of time. We hopefully do this with the expectation that those things move down in history and become iconic. Pierluigi Rolando was the first to do this for Fila, and we are simply carrying on the tradition from a design perspective. Good design is classic and stands the test of time.